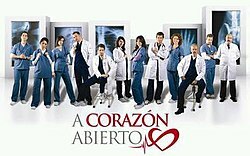 A Corazón Abierto is a Mexican telenovela produced by RCN Television in collaboration with Vista Production (first season only) and Disney Media Network Latin America. Based on Shonda Rhimes' Grey's Anatomy, it is adapted and supervised by Colombian writer, Fernando Gaitán. It marks the return of Sergio Basañez as a protagonist with the presentation of Iliana Fox as a protagonist. It also marks the return of Angélica Aragón to the television screen after 8 years of abstinence, since El Regreso, Juan David Burns as producer, and Raul Quintanilla as director. It was originally planned to air on Azteca 7, but was changed to Azteca 13, replacing Emperatriz, on 9 November 2011. It was filmed in Colombia for eight months, from February to October 2011. In December 2011, Azteca 13 executives extended the novela for another 58 episodes, making a total of 138 episodes. 2012 episodes are filmed in Mexico, instead of Colombia. Elisa Salinas replaced her husband, Juan David Burns, as the producer in the second season. Filming of the second season ended on April 17. Due to successful public reception, the producers plans for another season. The executives of Azteca discussed with Disney Media Networks for a third season, but later cancelled the idea. Alex Karev First year intern in Season1, later third year intern in Season 2. Isobel "Izzie" Stevens First year intern in Season1, later third year intern in Season 2. George O'Malley First year intern in Season1, later third year intern in Season 2. Claudia's husband, Diego's father. Callie Torres Orthopedic surgeon. Jorge's wife, Diego's mother. Has cancer in season 2. Episode 40-93. Miranda Bailey Season 1: Third year intern, chief of first year interns. José Carlos Rodríguez Germán de la Garza Hospital administrator. Estefania Godoy Sandra Galindo Nurse. Mauricio's accomplice. Season 1 only. The role of Maria Alejandra was actually given to Edith González, but was replaced by Adriana Louvier, and eventually Iliana Fox. Later, Gonzalez stars in Cielo Rojo, and Louvier in Emperatriz. Most cast and crews have worked together in other telenovelas produced by Azteca such as Cuando seas mía (Fernando Gaitan, Elisa Salinas, Juan David Burns, Sergio Basanez, Iliana Fox, Rodrigo Abed, Rodrigo Cachero, and Alejandro Lukini) and La Duda (Jose Carlos Rodriguez, Fabiana Perzabal). Venezuelan actress Johanna Morales is promoted from recurring role to starring role in Episode 74. The second season is filmed in Mexico. Since Venezuelan actress Johanna Morales could not continue to stay in Mexico, therefore her character is killed off. ^ NTX / IAMR (17 January 2011). "Presentan A corazón abierto, nueva serie de TV Azteca y Disney" [Presenting A corazón abierto, the new series of TV Azteca and Disney] (in Spanish). Retrieved 18 January 2011. ^ "A Corazón Abierto Premieres in Mexico". Archived from the original on 12 September 2014. ^ Hernández Guijosa, Silvia Viridiana (26 January 2012). "Adrián Rubio, regresa en 2012 'A Corazón Abierto'" [Adrián Rubio, returns this 2012 in 'A Corazón Abierto'] (in Spanish). Archived from the original on 3 February 2012. Retrieved 27 January 2011. ^ "Analizan tercera temporada de "A corazón abierto". Con Flor Rubio". Radioformula.com.mx. Archived from the original on 12 September 2014. Retrieved 13 August 2012. ^ Garduño Villaseñor, Lilia Priscila (22 March 2012). "Leonardo García se integra a 'A corazón abierto'" [Leonardo García in "A corazón abierto"] (in Spanish). Archived from the original on 24 March 2012. Retrieved 22 March 2012. ^ "La Nueva". Archived from the original on 16 June 2013. Retrieved 22 May 2016. ^ Azteca Internet (10 February 2012). "Juan Manuel Bernal.... ¡Guapo y con mucho talento!" [Juan Manuel Bernal.... Handsome and talented!] (in Spanish). Archived from the original on 1 March 2016. Retrieved 17 March 2012. ^ La Republica (16 September 2011). "Andrea Montenegro graba para serie de Sony 'A corazón abierto'" [Andrea Montenegro films Sony series "A Corazón Abierto"] (in Spanish). Retrieved 17 March 2012. ^ Zaldivar Gama, Irais Paola (5 March 2012). "No te pierdas la nueva etapa de A corazón abierto" [Don't miss the new season of "A corazón abierto"] (in Spanish). Archived from the original on 8 March 2012. Retrieved 5 March 2012. ^ Ricardo Hernández (30 March 2012). "Quieren más de "corazón abierto"" [They want more of "A corazón abierto"] (in Spanish). Retrieved 30 March 2012. ^ Azteca Internet (9 March 2012). "Keyla Wood... ¡Una hermosa paciente!" [Keyla Wood... A beautiful patient!] (in Spanish). Archived from the original on 14 March 2012. Retrieved 17 March 2012.